Linking banner stands together lets you create a display solution suitable for exhibition shell schemes and booths. Attaching a larger linking banner between two standard D4 banner stands lets you build a much larger graphic display quickly without the need for an additional display stand. This makes linking banner stands a cost effective display solution. They can be used for trade show stands, stage sets and temporary exhibitions. 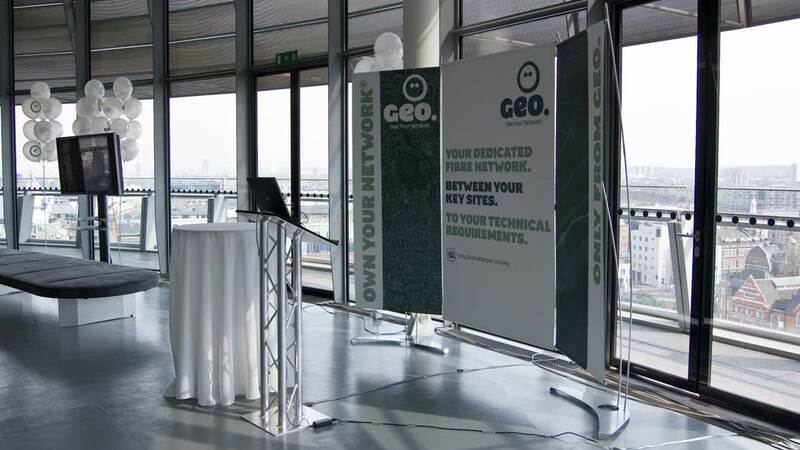 This simple feature allows you turn two stand alone D4 Banner Stands into a exhibition system. Linking Banner Stands are suitable for a variety of marketing activities including display graphics in shell scheme trade show stands. It provides a cost effective solution for exhibitors who want the flexibility of using single displays for certain events, but also need a bigger graphic display for larger exhibitions. Linking banner stands are designed for displaying promotional graphics. The D4 Linked banner display self assembly display system that be put together in about 10 minutes. Its stability and contemporary design mean it can be left in marketing suites & reception areas. Displays can also be collapsed into travel bags and are portable enough to be taken to trade shows. 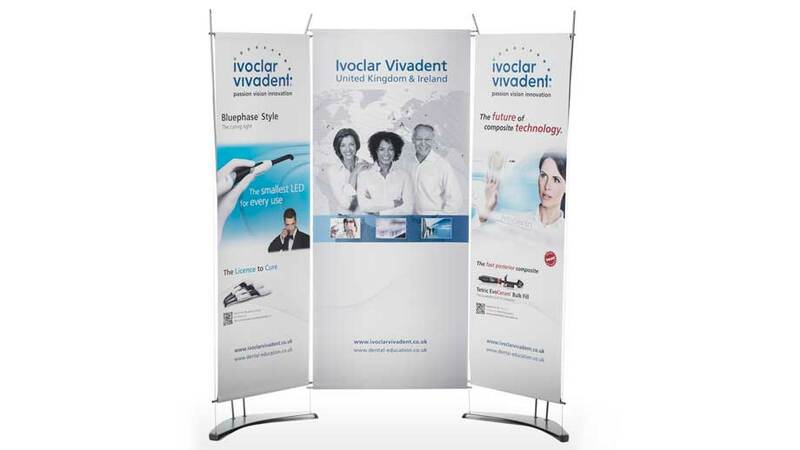 We produced 11 Linking Banner Stands system for Ivoclar Viviadent. A large multinational who manufacture dentistry equipment and supplies. They wanted a system where they could use swap the banners around and use them individually and also as small exhibition system. Linking banner stands are a great alternative to the common place pop up display. These lightweight D4 banner stands allow the user to create a variety of display configurations. Another benefit is that the user can change the banner graphics easily without having to send the system back for re-fitting. See our how to display banners gallery.